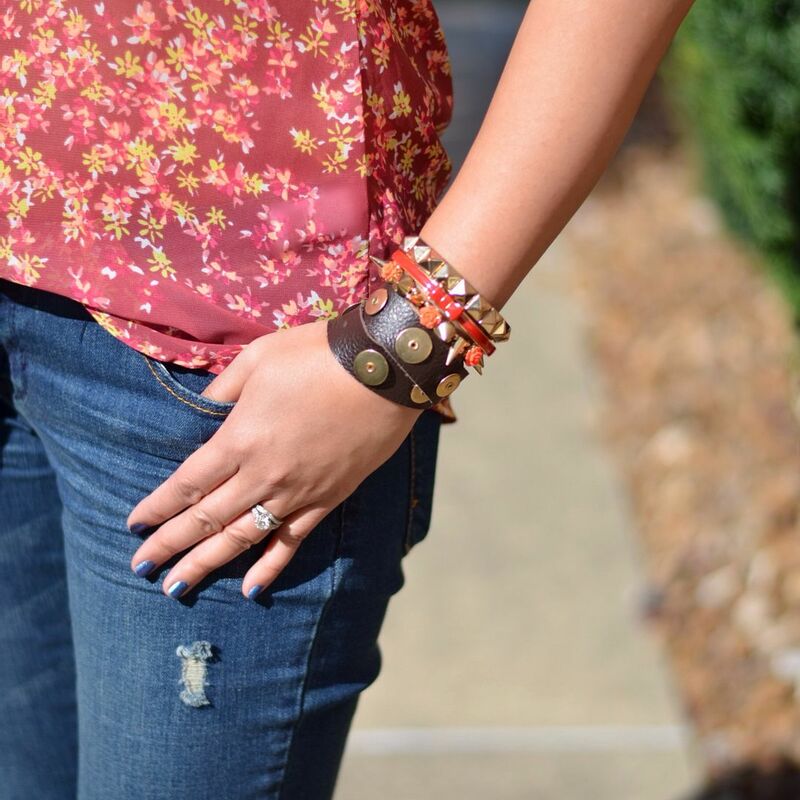 I la-la-love pairing sweet with funky and that's exactly what I think of when I think of floral and distressed jeans. I'm not really sure how I survived without distressed jeans in my life before. I was never ever drawn to them until the last year or two, and now it's all I want to wear. The look, the feel - they add a touch of edge just like heels automatically add a touch of glam to any look. I was immediately drawn to this pin above, especially since the booties make this a perfect transitional look. Awesome how my top matches the leaves in the background! The last time you saw this top, I pattern mixed it with some dot shorts here. The distressed jeans and booties make it more rugged chic, no? Such an easy outfit to just throw on and go. I wore this to brunch this weekend to our favorite local restaurant called Cleveland Heath. I love that their website describes the food as "gourmet comfort." That really is the perfect description. Comfort food with a twist. Like Deviled Eggs - but with hot sauce. Biscuits and gravy - but the biscuits are more like cheddar biscuits. And the Beignets are freaking to die for. I'm getting hungry thinking about it! So, if you ever come to visit me, you're guaranteed a trip to Cleveland Heath. Now i think you have all the portofinos, this one looks so good with your skintone. I think I might sell some of mine....only so I have less than you. omg cheddar biscuits sound so yummy! Love those distressed denim with the booties! Thanks! I accidentally ordered another pair of distressed jeans last night. I have a serious problem!! 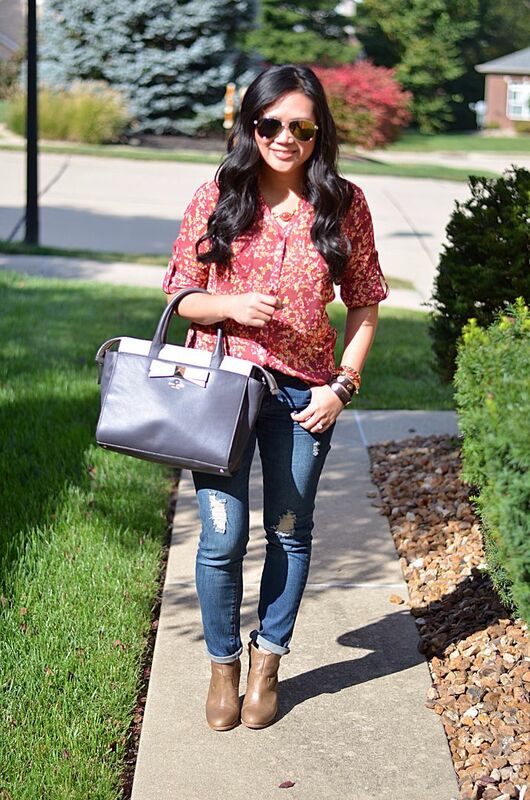 Ah, this shirt has been hibernating for awhile and I love how you styled it for fall! This look is just perfect! And oh the irony of Cleveland Health and their cheddar biscuits. Ha! Heath! No L! Which is funny bc my friends always read it as Health! It really is amazing though!! And thanks! Still one of my fave portofinos even if it's more recognizable and therefore not worn as much! Such a pretty floral top! Love it paired with the boyfriend jeans and booties! That restaurant sounds amazing - I love biscuits and gravy and the cheddar biscuits would make it so much better! Oh it's so indulgent and delicious! It's always our go to place to eat when we want to spoil ourselves! And thank you so much! This top was easy to fall in love with! I love distressed denim! One of my favorite items to wear. 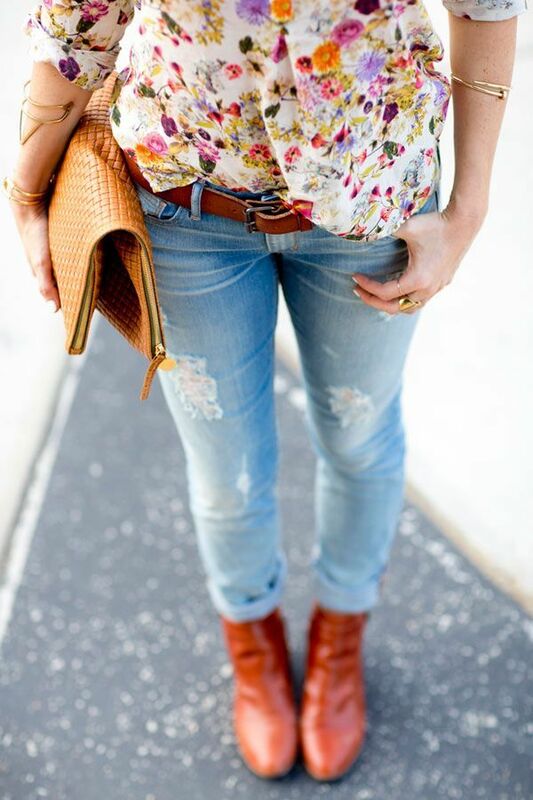 Love how you styled the floral shirt! Thank you! And glad you can relate to my addiction!! Love everything about this look!! Florals and distressed denim is perfect for fall, I have the sleeveless version of this top too:) Hope you are having a great week. it's such a great print - makes me happy!! You have the most amazing collection of Express tops! 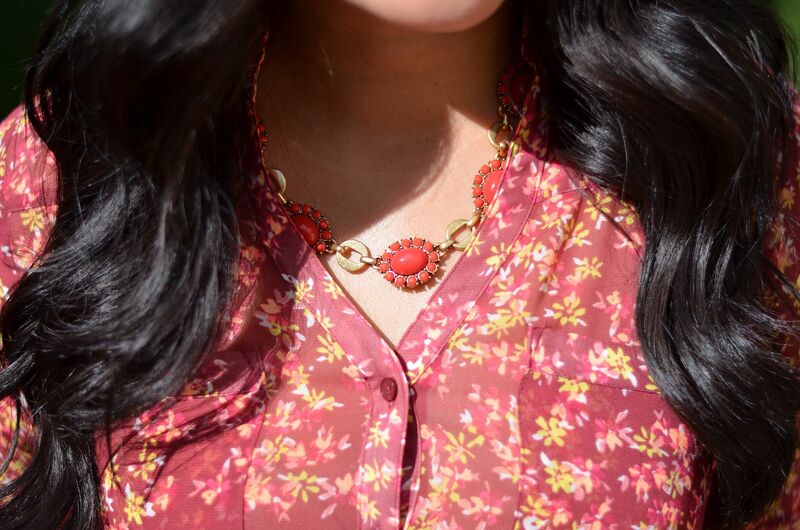 How perfect is that color for fall?! Love it! I would love love love to come visit you and chat over a Cleveland Heath meal! Sounds amazingly delicious! Oh, thank you! And would gladly take you there!! Such a pretty top and I love the jeans! Happy Wednesday...xo! So cute!! Love it!! I'm especially drooling over both floral top. I'm with you, I passed on distressed jeans for so long, but now I'm eyeing jeans in my closet thinking how I can DIY distress them so I have more in my wardrobe! They are just too fabulous. They really are. So funny how our tastes naturally change. I love your reasoning behind this outfit, it is such a great combination I would not have thought of before. The blouse is so beautiful, I just love florals so much. 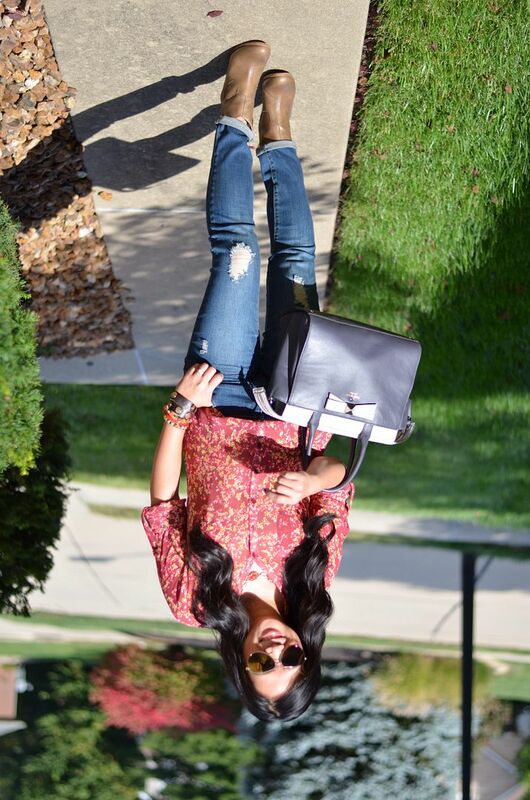 That is the perfal Fall Floral Top especially paired casually with jeans and brown booties. =) Well Done babe! Pretty! I am IN LOVE with distressed denim also!!! Thanks, lady! And thanks for hosting!! GREAT look! Yup, I am actually about to thrift some jeans and create a few distressed look for the fall! Yes! Excited to see this!! !